Blowout Sale! Save 54% on the Autley AC600Mbps USB Wifi Adapter 802.11ac USB Wireless Adapter Dual Band USB Wifi Dongle for Windows 10/8.1/7/XP/Vista Mac OS X 10.4-10.11 by Autley at AABX. MPN: AW600. Hurry! Limited time offer. Offer valid only while supplies last. 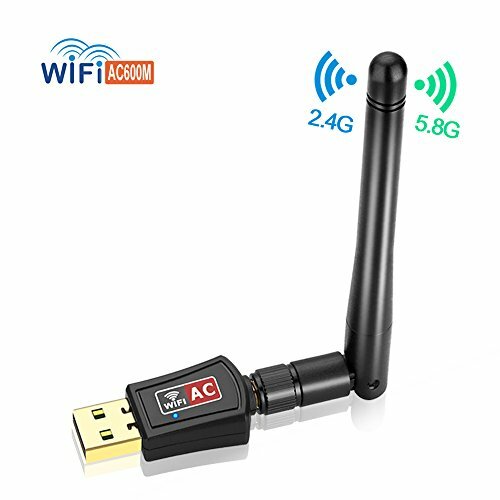 The link to download drivers: https://goo.gl/Uvewod (Windows), https://goo.gl/uJDwQY (Mac) When do you need Autley 802.11ac usb wifi adapter? 1. When do you need Autley 802.11ac usb wifi adapter? 1. Connect your desktop/pc to wireless network instead of ethernet cable. 2. The wireless card is broken in your laptop. 3. Upgrade your PC/laptop to 802.11ac wifi standard, get faster speed and wide coverage. 2. The adapter is used to transmit wireless signal based on the current network, not designed to increase the network speed. 3. 433/150 mbps is the maximal speed. The real speed depends on the current network condition and the load. 4. The wifi adapter works at 5GHz if your wireless router supports 5GHz. 5. The adapter works only when it is plugged into usb port on the computer/laoptop. If the usb wifi adapter stops working, please unplug it, plug it again, or restart the computer. If it does not still work or the indicator light does not work, it is defective. Please contact us for help. 1. The latest & most powerful Wi-Fi technology - 802.11ac, 3 times faster than 802.11n wireless network. 433Mbps at 5GHz is deal for gaming online and seamless HD video streaming. 2. The external 2dBi adjustable & detachable omni-directional antenna provides good performance and wide coverage. 3. Supports dual band(2.4G/5.8G). Backward compatible with 802.11n/g/b/a. 4. Soft AP mode supports to create a wireless LAN network when the wired internet is available on your computer. 5. No drivers required for Windows 10. Just plug and play. ★Transmission Speed: The usb wifi adaper up to maximum 150Mbps at 2.4GHz or 433Mbps at 5GHz, ideal for gaming online and seamless HD video streaming. Auto-detects and changes the network transmission rate. ★Powerful External Antenna: With high gain 2dBi long-range antenna keeps good stability, no more drops, free rotation to widen signal coverage. The usb wireless adapter gets better performance for network connection. ★Wide Compatibility: This 802.11ac wifi adapter for pc laptop desktop, supports Windows 2000/XP/Vista/7/8.1/10(32-bit/64- bit), Mac OS X 10.4-10.11. Just plug and play for Windows 10. Works with any wireless routers. If you can't use the CD, please download drivers from the link in the detail page. ★Easy to Use: Install drivers, insert the wifi usb adapter, select station mode to connect to existing wireless network or AP(access point) mode(works on Windows, not for MAC) to establish your wireless LAN network, which provides WiFi to your phone, tablet, laptop etc. ★Our Service - At Autley, 90-Day Money-back Guarantee and 1-year warranty are available for this product. If any problem, please contact us through amazon message or the customer service card in the package. If receiving the defective product, we offer a replacement or full refund.